Pictured left to right: Mackenzie Brown, Scioto Foundation’s Patty Tennant, Program Officer-Donor Services and Flour-BWXT’s Deneen Revel. The Scioto Foundation has announced the establishment of the new MacKenzie Brown Type I Diabetes Scholarship Fund. MacKenzie, the youngest individual ever to create a fund at the Scioto Foundation, is a junior at Notre Dame High School. She has set up the fund to help students diagnosed with the disease take care of college expenses. MacKenzie and her parents, Kim and David Brown, have set criteria for those who are eligible for the scholarship which was established with an initial gift of $1,000 from Fluor BWXT. The scholarship recognizes students who are actively involved in the diabetic community, who participate in community and/or extra-curricular activities, and who demonstrate that they are successfully managing the challenges of living with diabetes. To be eligible for the scholarship, a student must be continuing his/her education beyond the high school level, have a childhood diagnosis of Type I Diabetes, and be successfully managing diabetes with proper medication, exercise and diet. The applicant must also write an essay describing his/her life as a Type I Diabetic. Scholarship selections will be made by the Scioto Foundation’s volunteer scholarship committee. MacKenzie was diagnosed with Type I Diabetes in May, 2008 at the age of 9. Each year the number of children diagnosed with Type I Diabetes increases by 3 percent worldwide. MacKenzie recognized the need for Type I Diabetes awareness and fundraising so she started an education and awareness campaign in November of 2015 during National Diabetes Awareness Month. First she partnered with Southern Ohio Medical Center to spread awareness about Type I Diabetes and to set up a fund for juvenile diabetes. “The Annual Development Fund for Juvenile Diabetes was developed to help financially disadvantaged Type I Diabetic families get to and from out-of-town doctor appointments and help with meals and other expenses such as lodging and medical copays, said MacKenzie. McKenzie launched her campaign by persuading the Notre Dame and Portsmouth High School athletic directors to organize a basketball game between the two schools on November 24, 2015. Proceeds from the game, t-shirt and wrist band sales, a raffle, donations, concessions, and $1 dress down days in all amounted to $6,000 raised by MacKenzie for families impacted by Type I Diabetes. To develop awareness MacKenzie developed and displayed educational boards, educational materials and Type I Diabetes supplies at both Notre Dame High School and Elementary School. She spoke to various school-aged children in their classrooms and Notre Dame and Portsmouth Elementary Schools about Type I Diabetes signs, symptoms and the difference between Type I and Type II Diabetes. She was also interviewed by local newspapers and was featured on a segment of WSAZ News on the subject. “My mission is to educate the community to make others aware about this disease, how to recognize the signs, symptoms, and how to help someone with Type I Diabetes. It may save a life! Diabetes is my life, educating, spreading awareness and helping others is how I live beyond Type I,” said McKenzie. Valley TID Support Group of which she is a member. MacKenzie is one of 16 young people selected to be a JDRF Southwest Ohio Youth Ambassador for 2016-2017 and has been featured on websites like Project Blue November and Beyond Type I for her positive attitude and persistence in helping to reach a cure for Type I Diabetes. After high school graduation MacKenzie will pursue a B.S. degree in pre-medicine and ultimately become a pediatric endocrinologist. She plans to continue to educate and raise awareness about Type I Diabetes and is currently organizing a diabetes color walk/run at Notre Dame Schools to raise funds for JDRF. On July 28 at the SOMC Friends Center, MacKenzie will continue her awareness and educational efforts when she holds a camp, “Pumped on Insulin,” for all ages of young people who have Type I Diabetes. The camp will be part of her community service as Notre Dame High School’s representative in the 2016 Miss River Days Festival. Vendors will be attending as well as diabetes educational speakers. MacKenzie and her parents are grateful to the community which has been very supportive. 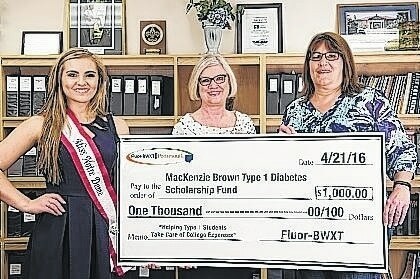 Now they hope the MacKenzie Brown Type I Diabetes Scholarship Fund will call more attention to this disease that strikes young people, and with hard work by MacKenzie, her family and friends, attract both donations and applicants in the future. Family, friends, organizations or the general public may contribute to the fund at any time. Donations to the MacKenzie Brown Type I Diabetes Scholarship Fund may be in the form of gifts of cash, securities or property. Additional information about the MacKenzie Brown Type I Diabetes Fund or other planned giving opportunities at the Scioto Foundation may be obtained by contacting Patty Tennant, Program Office – Donor Services, or SF Executive Director Kim Cutlip at (740) 354-4612.